John Fudge belongs to a select group of Colorado-based painters whose careers began flourishing in the 1970s and ‘80s, eventually earning them national renown. In the case of Fudge, though, who died in 1999, surveys of his work have been scarce, partly because his professorial duties at the University of Colorado took time away from the studio and partly because he was more methodical than prolific. Fudge gets his due here with a show of 13 paintings representing more than three decades of his irreverent, ribald and edgy compositions. Given its modest size, the survey manages to lay bare the artist’s many obsessions — generally in the realm of pop culture, zeroing in on such oddities as the Dracula story, George Reeves of the vintage “Superman” TV series, and cross-dressing. In addition, images take on topics that were anathema to the artist, including abuses of power and wealth, religious indoctrination and war for war’s sake. Indeed, “Double Take” is an apt title for the show. Viewers come to understand that despite the outward, “Mad Magazine”-like satirical humor of most of the pieces, the detailed and meticulously rendered compositions nevertheless compel that turn of the head, that second look in order to parse their messages. One of the standout examples is the hyperrealistic “Everything in One Place” (1994), depicting the aforementioned Superman and J.R. “Bob” Dobbs, a so-called prophet from a mid-20th-century movement parodying religion called the Church of the SubGenius. Both men are posed in the foreground of a cemetery in which a gravestone for Hitler is partially visible. Behind them are two Roman soldiers in an armed face-off — a reinterpretation of Jacques-Louis David’s 1799 painting “The Intervention of the Sabine Women.” Farther back, a contemporary axe-wielding figure chases a girl, striking us how Superman and Dobbs appear oblivious to the murder and mayhem. 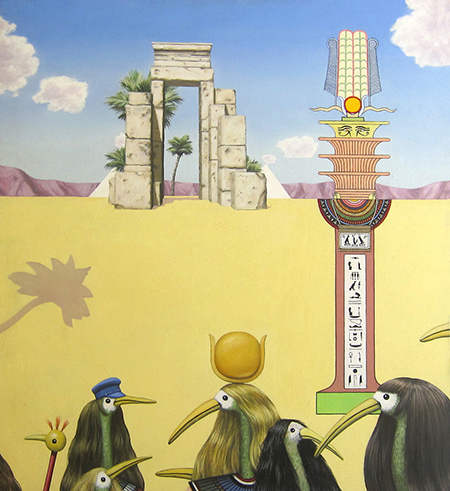 A lighter theme prevails in the Egyptian setting of “Cathy Jean and the Roommates” (1975), featuring ibises wearing Cleopatra-like, longhaired wigs, including one ibis that is said to represent Fudge in cross-dressing mode. The painting merits study for the way it plays with perspective and object placement. Fudge’s artist’s statement from years ago contains this quotable aphorism: “I want to serve up a meal, not just offer a glass of water.” Because his paintings brim with sociopolitical messages, alongside the comical juxtapositions of objects and people, it’s fair to say Fudge is an absurdist with a cause.